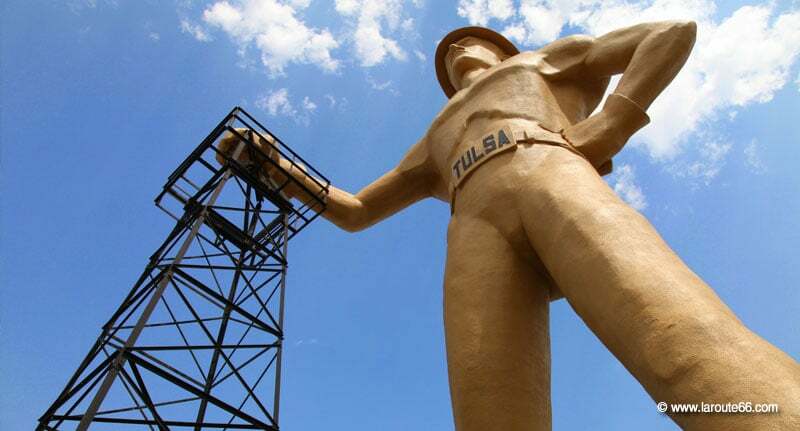 Above: The Golden Driller in Tulsa, Oklahoma. 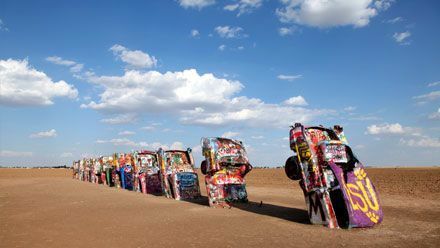 Among all the states traversed by Route 66, Oklahoma holds the record for the distance traveled by the legendary track with some 430 miles (700 km). Now, this is the route as it stood in 1926, this distance was however reduced to 380 miles during the re-alignment of Route 66 in 1937. And it is no coincidence that the contractor appointed by the U.S. government to design the layout in 1926 called Oklahoma his home state. For as we draw a straight line from Chicago to Los Angeles, we can immediately tell that Oklahoma is far off the way -well down south! In fact, Route 66 should have crossed the entire Kansas territory but the cunning Cyrus Avery, known as the "Father of Route", did not hesitate to divert the route through his home state. In this way, Oklahoma also enjoyed the great economic boom that sparked Route 66 in its wake! Above: Route 66 enters Oklahoma through the city of Quapaw. The arms of the state portraying, a pipe, an olive branch, and the shield of the Plains Indians, appear on the sign announcing the boundaries of the "Indian Territory". 430 miles ... Route 66 would be crossing an entire country in other latitudes. 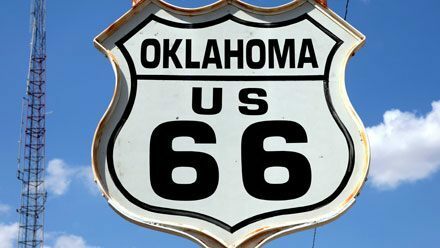 In Oklahoma, it is possible to stay on Route 66 without ever hitting the Interstate (with the exception of a short segment around Oklahoma City). 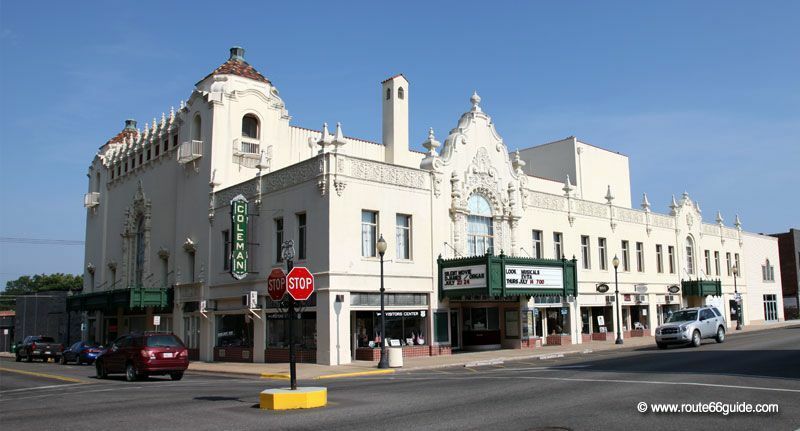 Above: The Coleman Theatre in Miami, Oklahoma. As you move forward, you will start to notice how the landscape evolves; a glimpse of immense America. Forests and rolling hills that open to the north, south, onto the first arid plains and the desert ... so dreaded by the pioneers. A hostile land, without mercy for those who approach and settle down, of contrasting climates and swept by frequent tornadoes. Thus, many house gardens feature impressive concrete structures hiding underground tornadoes shelters. This is what is commonly referred to as "America's heartland". 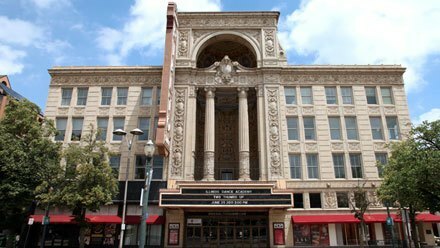 Cities are tiny - except for the sprawling Oklahoma City - and locals often appear surprised to run into ... tourists? Above: Oklahoma State Capitol, Oklahoma City. Route 66 offers here one of its most beautiful faces: the local association is particularly active and the road unfurls its museums, motels, restaurants, and gas stations, often magnificently restored. Some legendary establishments concentrate on its edges, such as the "Rock Cafe" of Stroud, built with the stones of the Route 66 - and lately identically rebuilt after a fire. 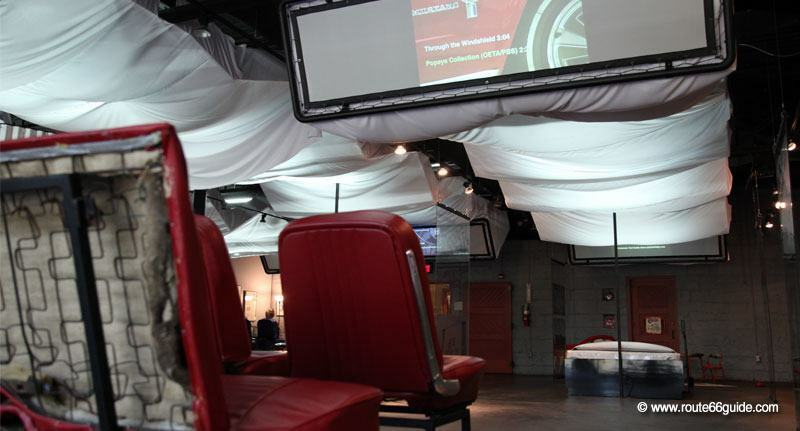 We also highly recommend the Oklahoma Route 66 Museum in Clinton, which many experts define as the best of its kind, a succession of rooms recreating the atmosphere of "pop and mom" business of the heyday of Route 66; garage, dining, drive-in, etc. A walk back in time to the musical standards of the time that the visitor activates on entering the various rooms. 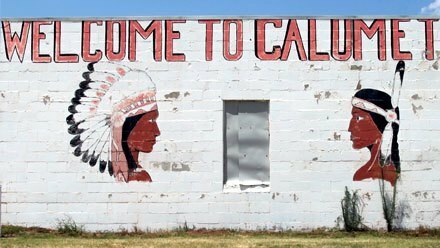 In short, we begin here a beautiful adventure in the mists of history, on the edge of Quapaw, the first town on the Kansas border. Waylan's Ku Ku Burger Miami (not to be confused with Miami, Florida; the pronunciation is also different) is the last survivor of the legendary "Ku Ku" chain. Old-style fast food, today, as in 1965, topped by a charming neon sign ... and its "Cuckoo" bird. 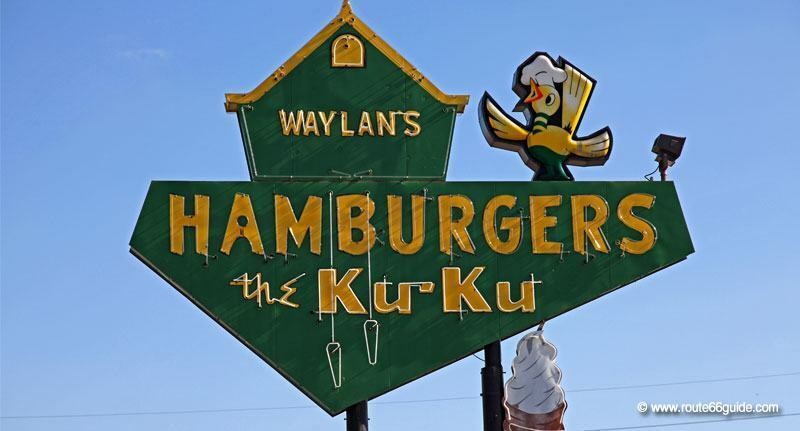 Above: Waylan's Ku-Ku Burgers in Miami, Oklahoma. The very old segment of Route 66 near Narcissa. In 1922, lacking the necessary funding, only a thin strip at the centerline of the road is paved, forcing vehicles to overtake using the unpaved roadsides. Above: Between Narcissa and Afton, Route 66 was partially paved, i.e. 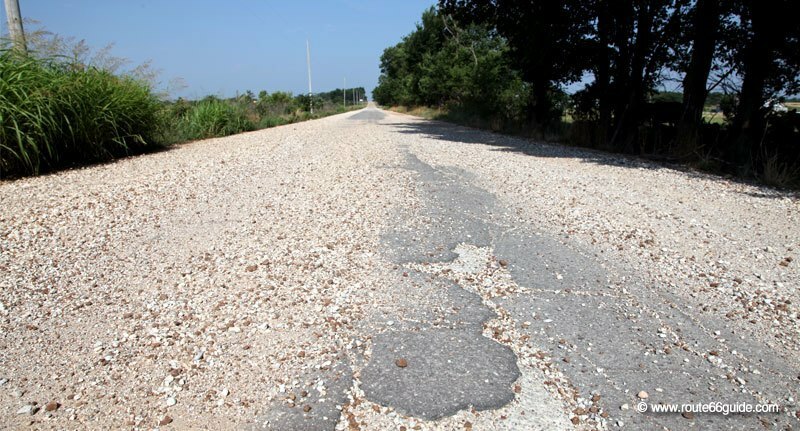 only the centerline of the road was surfaced given the limited funding available. 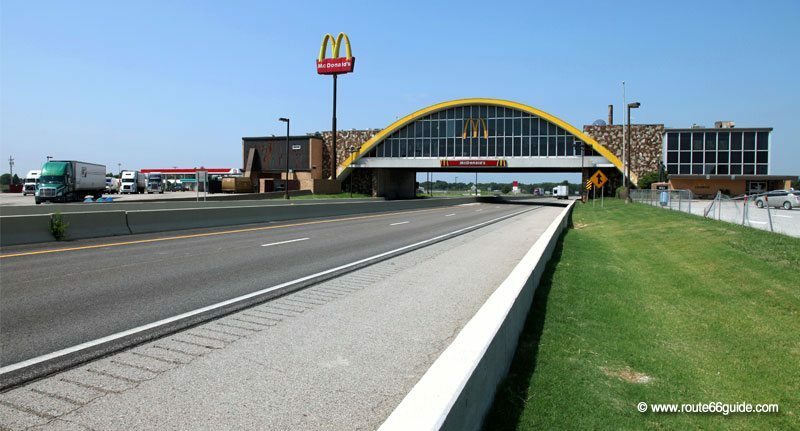 The world's former largest McDonald's in Vinita, is worth a visit even if you hold a small grudge against the fast food giant, as its logo respects the vintage spirit by occupying this amazing structure built in 1957; a giant yellow arch that spans the highway. The most amazing thing is that this building was not initially built for McDonalds but for a road restaurant called "Glass House"! Above: The former largest McDonald's in the world. Vinita, Oklahoma. The first oil well in Oklahoma was built here in Chelsea, starting off a short epic that would permanently change the face of the state. The wells dug in Chelsea in 1889 were modest compared to the monsters built today (up to 30,000 ft. deep); see an example in the outskirts of Chelsea following Route 66 towards the west. Above: Chelsea, Oklahoma. A fake oil well in front of Chelsea Motor Inn. Totem Pole Park near Foyil is the work of a woodcarver from Missouri who devoted his entire retirement, from 1937 until his death in 1962. 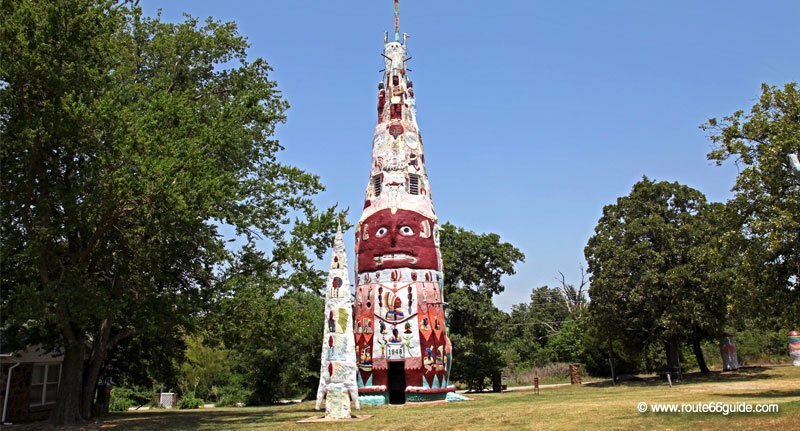 His work resulted in this park, featuring many totems inspired by Native American art and dominated by a giant totem of over 27 meters built in 1948, and which still holds the world record. Above: The Totem Pole Park near Chelsea boasting the highest totem in the world. The J.M. 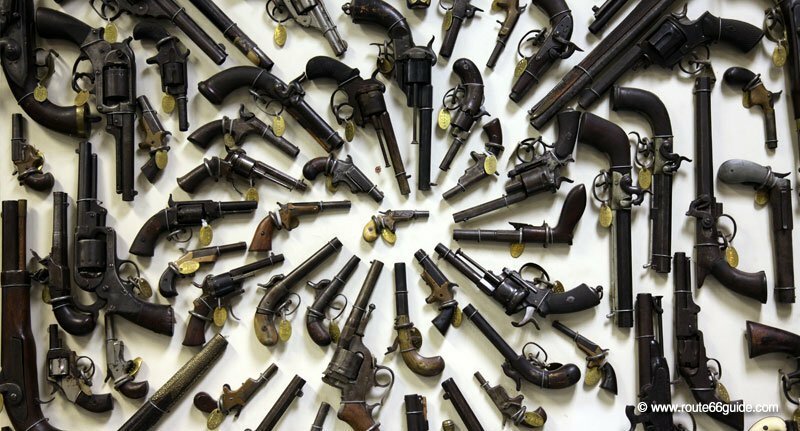 Davis Gun Museum in Claremore has the largest private collection of weapons in the world. The first gun in history (Chinese), the smallest one, and endless lines of exhibitors showcasing weapons manufactured around the world and models that belonged to famous outlaws (the Dalton Brothers, Bonnie and Clyde, etc.). Above: The J.M. Davis Gun Museum in Claremore, Oklahoma. 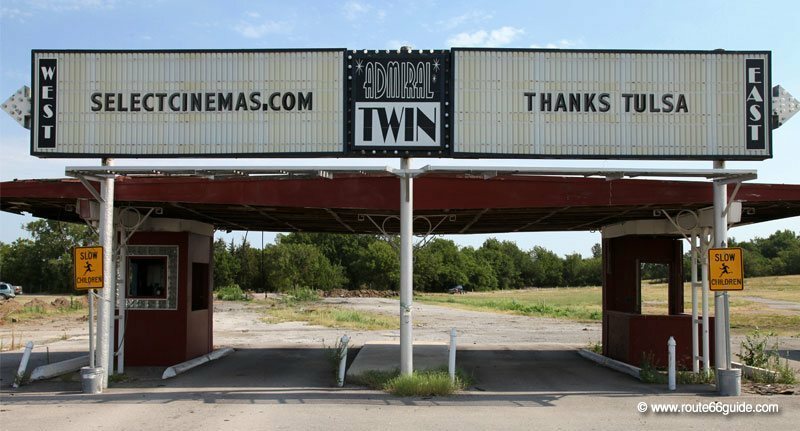 The Admiral Twin Drive-In Theatre in Tulsa is the largest drive-in theater in Oklahoma, and one of the few still projecting films near Route 66. Above: The Admiral Twin Drive-In Theatre in Tulsa, Oklahoma. The Blue Whale of Catoosa always appears on all Route 66 postcards, a mute witness to the most beautiful period of the Route, which saw the first vacationers and families seeking the westerly sun. The Whale of Catoosa was an inevitable stop for the little ones, who splashed in the pool and climbed onto the beautiful whale fins which metamorphosed into slides. Today, the water stagnates and it is forbidden to swim although the gentle whale remains in its small pond, beaming. 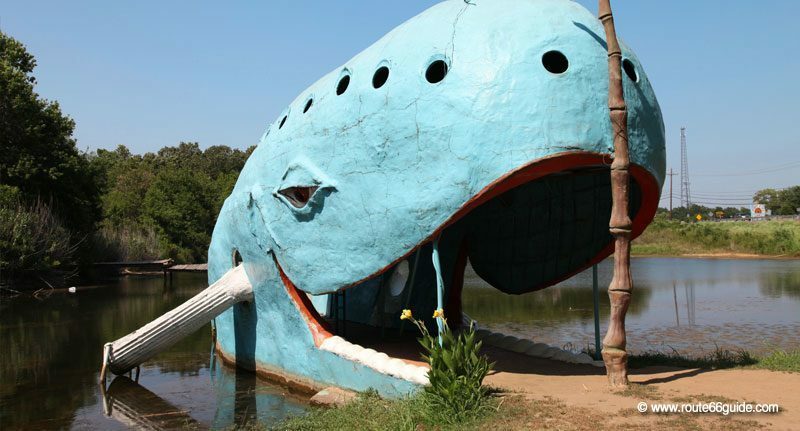 Above: Flagship attraction of families in the 1970s, the Blue Whale of Catoosa is now immersed in stagnant water, where no bathing is obviously allowed. 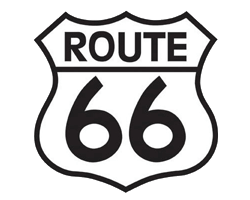 It remains a retro symbol of Route 66. 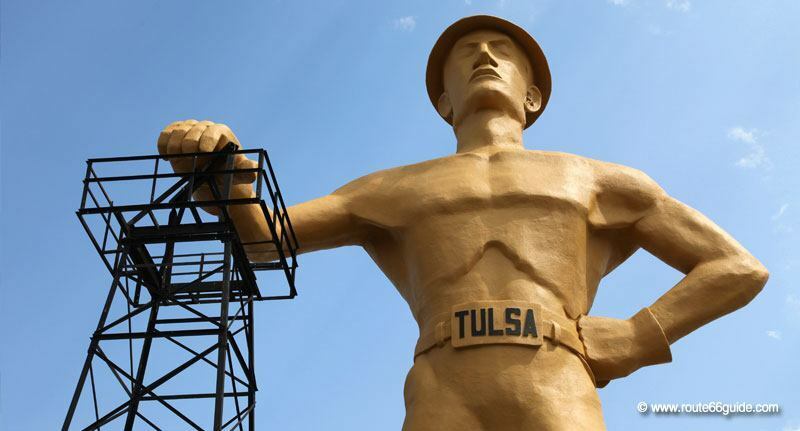 The giant sculpture of an oil driller in Tulsa (The Golden Driller) dominates the International Petroleum Exhibition, a tribute to the workers of the black gold that contributed to the prosperity of Oklahoma in the early twentieth century. 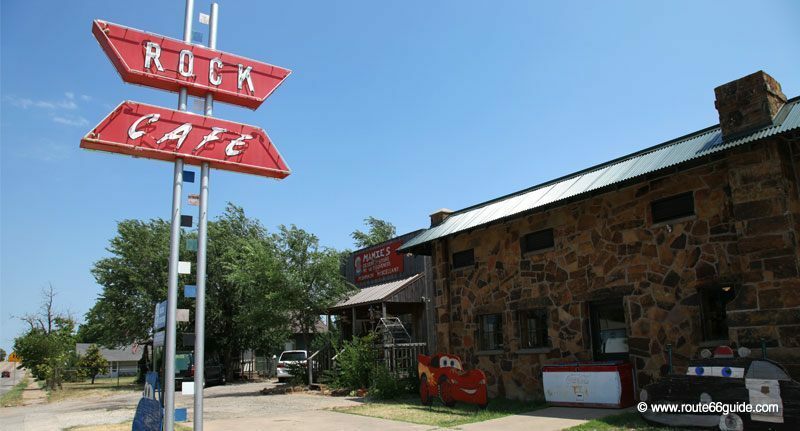 The Rock Cafe in Stroud was completely built with the surfacing stones of Route 66 in 1939. Destroyed by fire, it was rebuilt in 2008. Its owner, Dawn Welch, inspired the character of Sally to the screenwriters of "Cars", the successful Disney / Pixar animation movie. 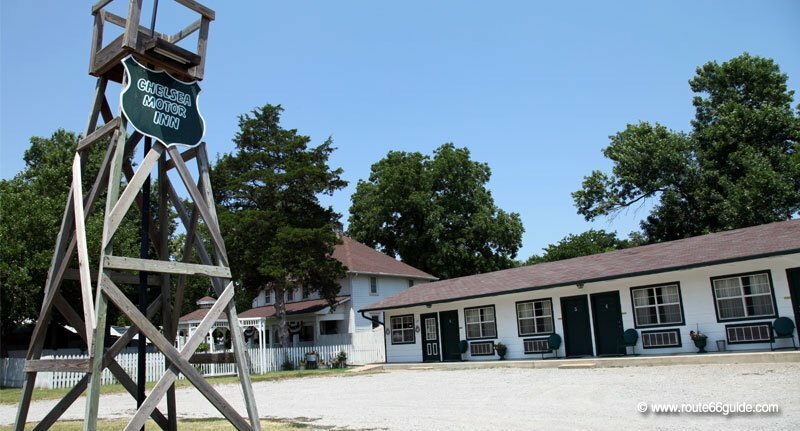 Above: The Rock Cafe in Stroud, Oklahoma. 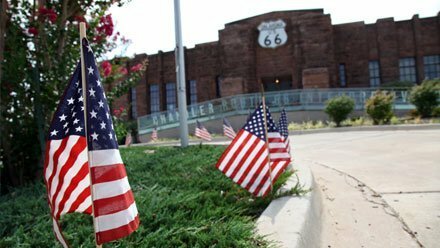 The Route 66 Interpretive Center in Chandler opened thanks to the contributions of the citizens of this small town on Route 66. More modern than most of its counterparts in other states, the museum relies primarily on reports, interviews and video archives of personalities and attractions of Route 66 in Oklahoma, which you can view sitting on the seats of old American cars or lying on a motel bed, next to a more conventional exhibition on the history of Route 66 in the state and its flagship attractions. 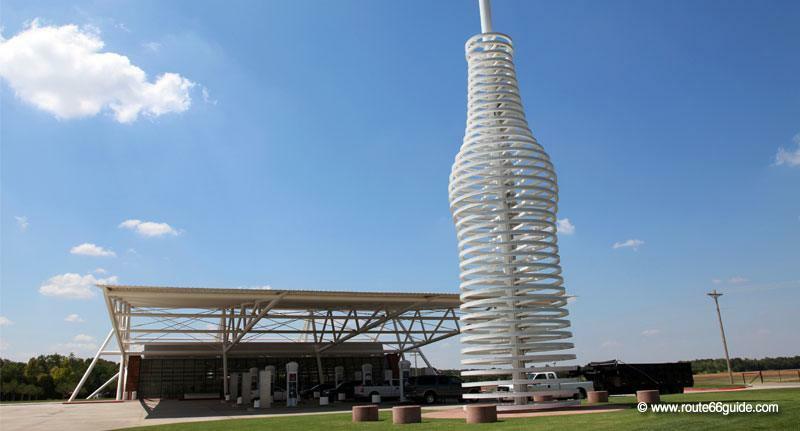 Above: Route 66 Interpretive Center in Chandler, Oklahoma. 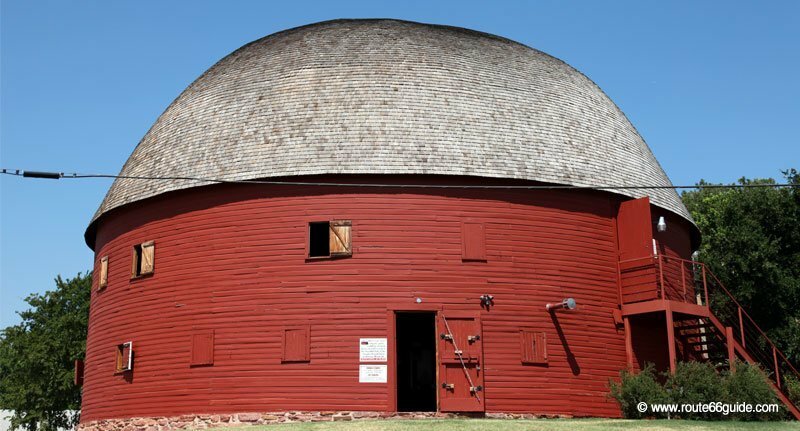 The Round Barn in Arcadia, completely restored in 1990, is a historical icon standing since 1898 and for good reason: it is assumed that its round shape offers less grip to the many tornadoes sweeping the region. Atypical, with its oak planks painted red, it also offers outstanding acoustics and the first level of the barn - superb with wooden arch in cathedral-style - can be rented for various private events. On the ground level, a small museum dedicated to the Round Barn and a souvenir shop helps fund the site maintenance. Above: Round Barn in Arcadia. Only twenty identical copies exist in the United States. Pops in Arcadia offers the largest variety of soft drinks in the world, more than 500 different sodas from which it is difficult to choose while standing in the crowd that jostles in front of the large fridges. There is something for every taste: super sweet, medium sweet light, with all fruits, from all countries - almost. It also offers a remarkable collection of root beer. Above: Pops in Arcadia, Oklahoma. The National Cowboy and Western Heritage Museum in Oklahoma City is entirely dedicated to cowboys, strong symbol of the so-called " America's heartland", precisely where Oklahoma stands. Here, the "cowboy" mindset goes beyond the advertising clichés and numerous livestock farmers still practice transhumance, traveling hundreds of miles with their flocks and their horses in search of greener pastures. 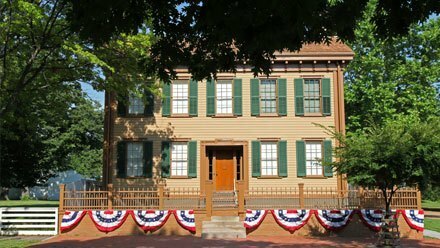 It is their story that this museum tells. The "Hall of Fame" honors the most famous cowboys, rodeo champions, and the actors that played them in the movies. Above: The National Cowboy and Western Heritage Museum in Oklahoma City. 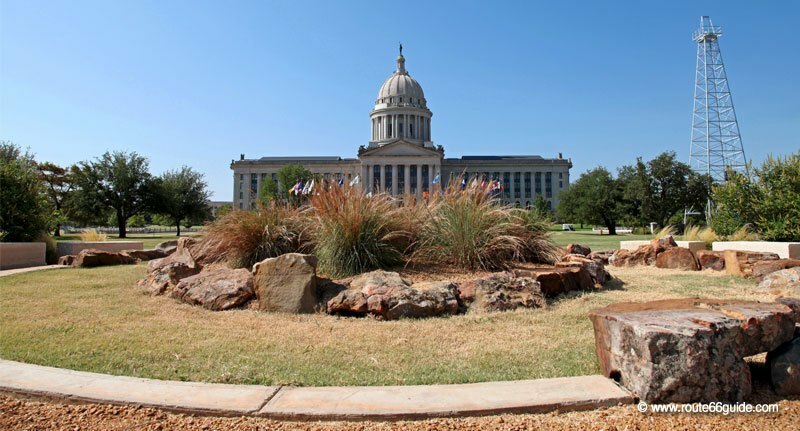 The Capitol and the adjacent, old oil wells in Oklahoma City, whose downtown area held numerous oil wells in 1928. Indeed, the municipality did not hesitate to drill more than 20 wells in the heart of the city (most of them no longer exist). 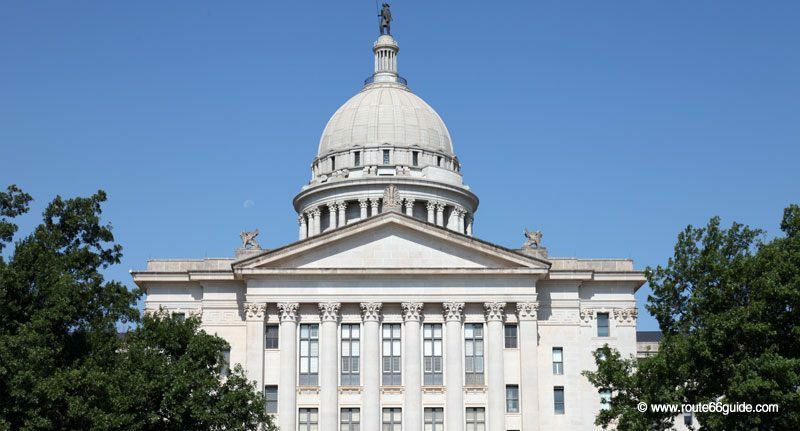 The Capitol stands as a silent and magnificent witness to this golden era, which saw Oklahoma rank eighth largest oil producer in the world. Above: The Oklahoma State Capitol, Oklahoma City. 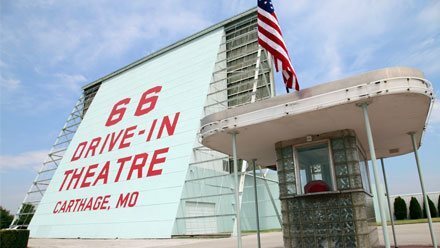 The Route 66 Museum in Clinton is widely recognized as one of the best of its kind along the historic route - although some would argue it is undeniably the best. 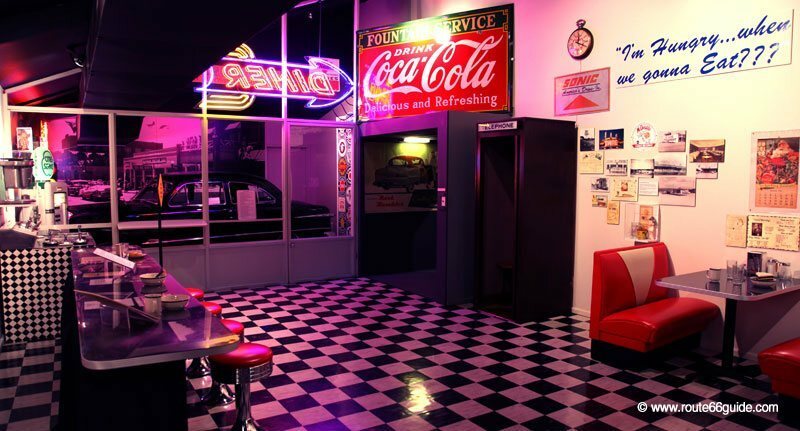 It takes you on a trip back in time through its showrooms restoring the ubiquitous "pop and mom" businesses of the heyday of Route 66: diners, garages, service stations, etc. The soundtrack of the time changes with every room and must be activated by the visitor. Oklahoma holds the record for the distance traveled by Route 66 with almost 430 miles (700 kilometers). Not surprisingly, Route 66's designer was born here. Above: Totem Pole Park in Foyil, Oklahoma. It is the only U.S. state run by Indian tribes. 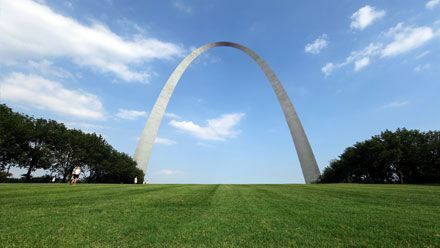 It bears the name of "Indian Territory". At the outset of the nineteenth century, forty Indian nations were forced to exile here. Here more than elsewhere, Route 66 will prove easy to navigate. Especially with the help of the official map distributed for free by the Department of Transportation of Oklahoma, which indicates the precise route of Historic Route 66 in the state. It is available in the main tourist offices, Route 66 museums, etc. 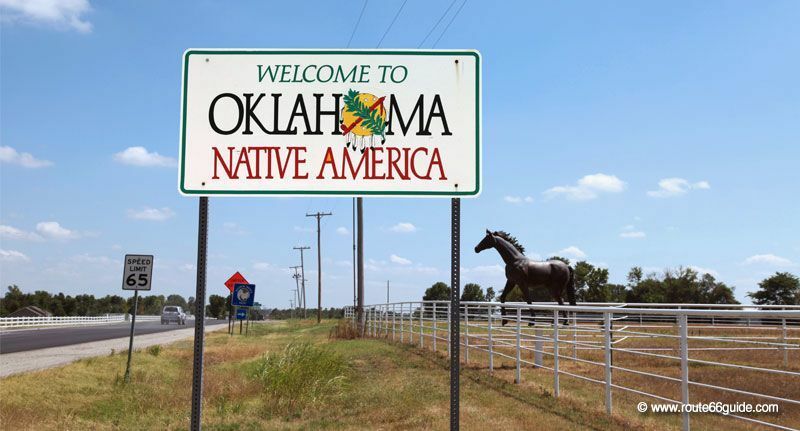 Designated "Indian Territory", Oklahoma is the only state run by Indian tribes. They entered the state in 1838, voluntarily but mostly forcefully displaced, following the infamous "Trail of Tears". 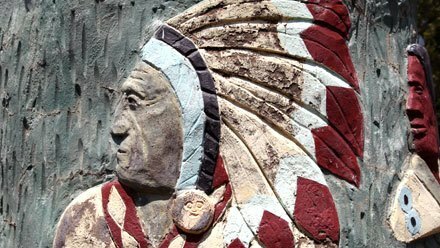 Today, the influence of some forty Indian nations who share the territory of Oklahoma is still very present, for example, in the state flag, which shows a pipe and an Indian shield. Every summer, the "Red Earth" festival brings together all the tribes in the largest powwow in the country, and the names of the places you will cross will be an introduction to their culture. 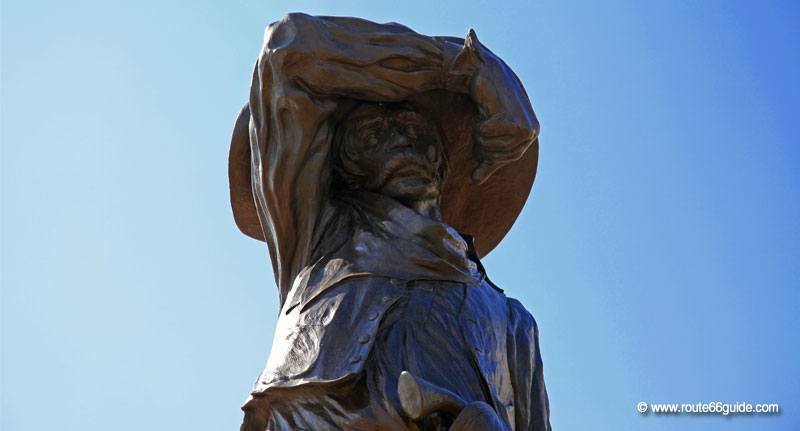 As the West was won, more than 50,000 pioneers flocked here for two "land rushes" taking place at the end of the nineteenth century in Chandler and Oklahoma City. A race with often life-changing issues at stake that sometimes got out of hand as, after the initial shot, candidates rushed to grab the land - to become theirs after five years of cultivation and maintenance - on a first come, first served basis. These poor exiles were willing to risk everything to own this piece of land, even to run before the shot ... or be shot on the spot. In 1920, a new rush sweeps across Oklahoma. It is black, massive, and ephemeral. Oil gushes all over, in the plains, in the backyards, and even downtown (about 30 boreholes were dug in downtown Oklahoma City!). Wells spring up throughout the state and pump at full speed the viscous liquid which ensures, if only for a short time, the prosperity of Oklahoma. Amazingly enough, the state becomes the eighth largest oil producer! This tremendous excitement is nonetheless short-lived. A few years later, Steinbeck’s "The Grapes of Wrath" describes the exodus of the "Oakies", those poor workers of Oklahoma, hungry and exhausted by the vagaries of nature, who leave their lives behind to take Route 66 towards the West, California and its promises of a better life.